Hey there! 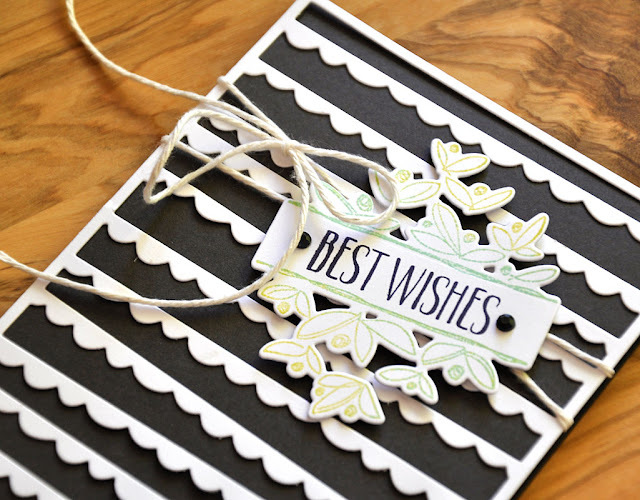 I'm back today for the final day of the July Papertrey Ink countdown. Everything you've seen peeks of will be available tomorrow! This simple little number uses the new stamp set... Tropics. Here I wanted to show you guys the two step palm stamp. This image comes in two pieces that fit together seamlessly, giving you a two toned look. A bit of Splits: Best Wishes and Cover Plate: Scallops on this card here. Well, there's one last quick look from me at Tropics, Splits: Best Wishes, and Cover Plate: Scallops. 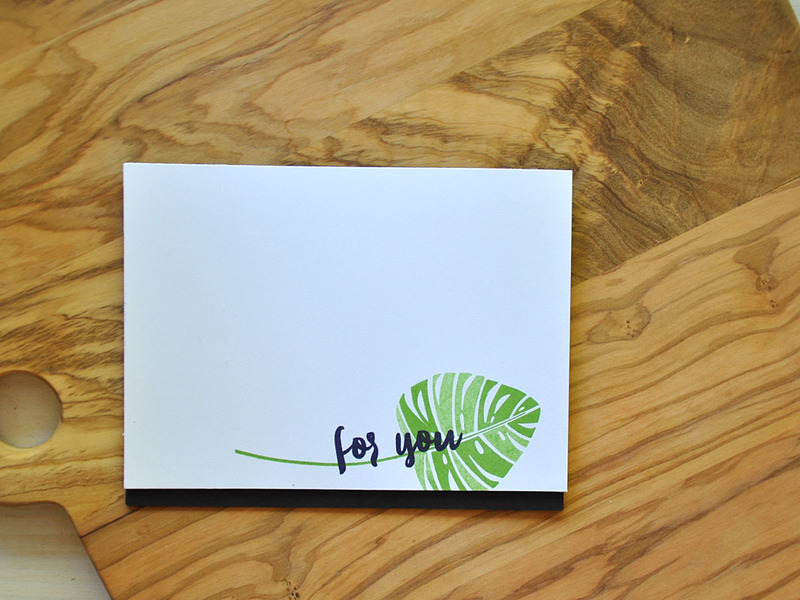 Just remember... all that you've seen today will be available for purchase through Papertrey Ink, beginning July 15th. Hi folks! Welcome to day four of the July Papertrey Ink countdown. Today I'd like to share a couple more Tropics samples with you. Also, this collection is featured on the Papertrey ink blog today as well. So stop by and check it out for all the details. Tropics is a unique collection of tropical palms and tribal designs. It can be adapted for summertime projects, masculine creations, backgrounds, focal points, borders and so much more. 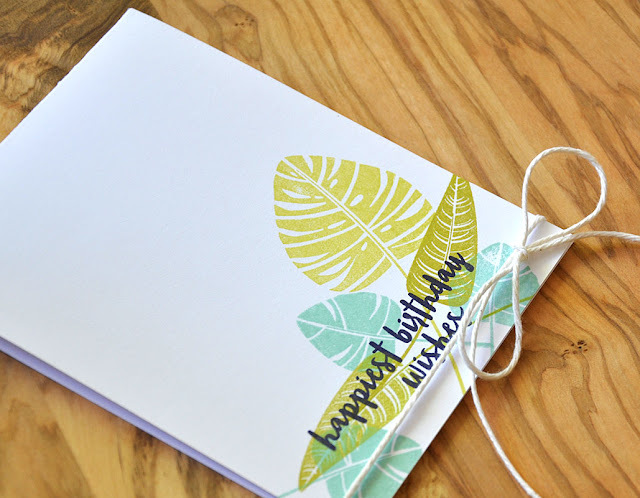 My first card focuses on one of the palms, which I've used to create a hand stamped repeating pattern in the New Leaf color. 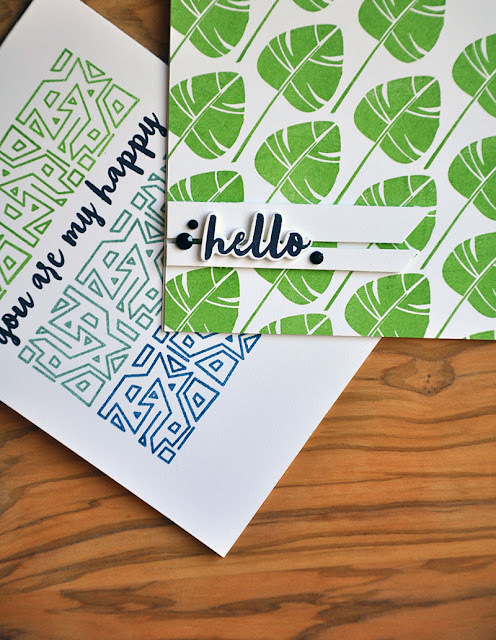 Available in the Tropics collection is a set of dies that coordinates with the sentiment included in the set. Here I've mounted a "hello" on two banners, which help to ground the phrase. A tribal design square is also included in the stamp set, I've used it here to create rows of color to frame the sentiment. Color combo... New Leaf, Ocean Tides, and Enchanted Evening. It's super easy to work with! I just rotated it as I stamped each row, giving this pattern a bit of interest. 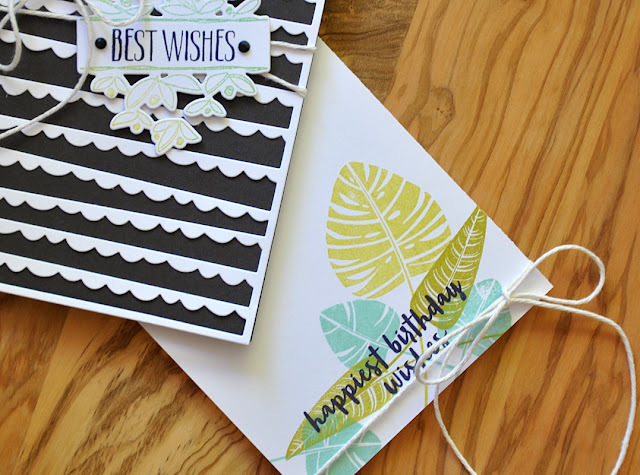 Well, there's a quick look at the Tropics stamp set and dies. 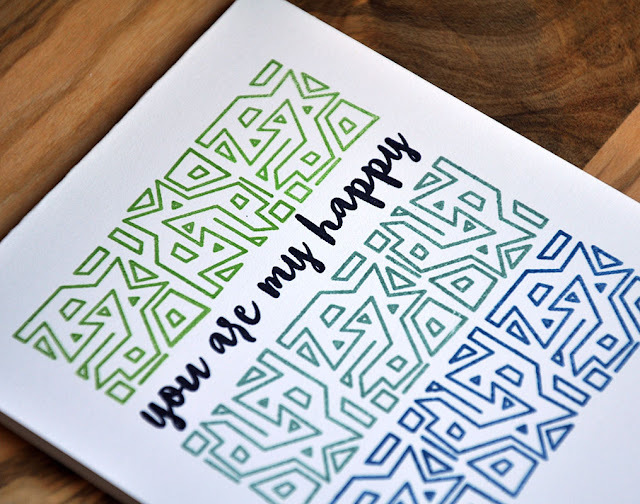 Just remember... all that you've seen today will be available for purchase through Papertrey Ink, beginning July 15th. Now, be sure to visit the Papertrey Ink blog for more details on these new product. Hi! Welcome to day three of the July Papertrey Ink countdown. My focus for today is the soon to be release Cover Plate: Scallops die. 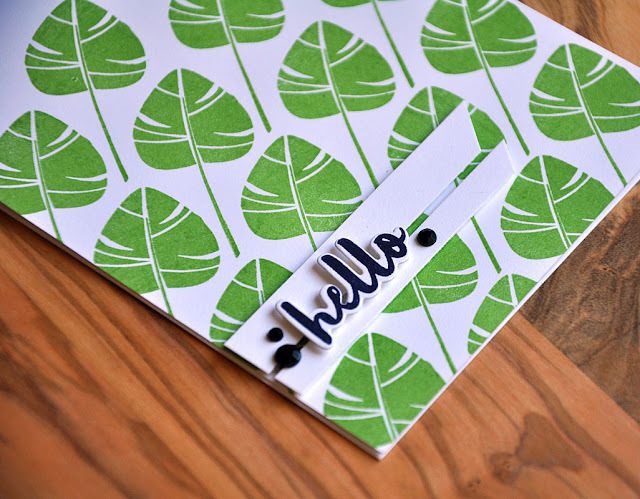 This cover plate has a bit of a whimsical look to it which makes it a great pair with many of the products this month. 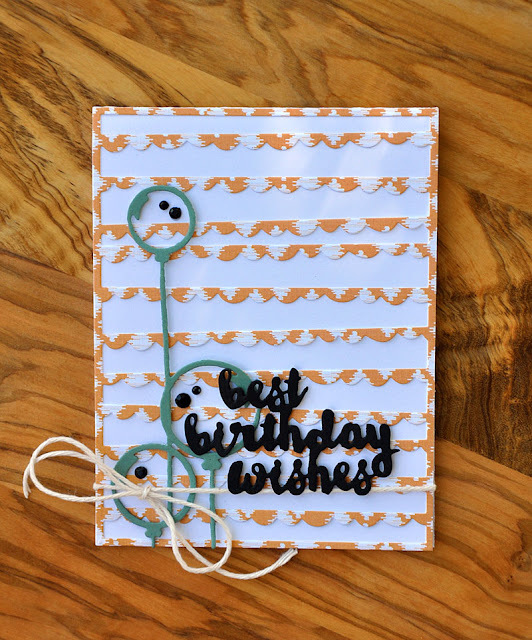 Or even previously release products like the Best Birthday die which I've used here. I die cut the cover plate from a sheet of pattern paper from the Super Succulents paper pad. 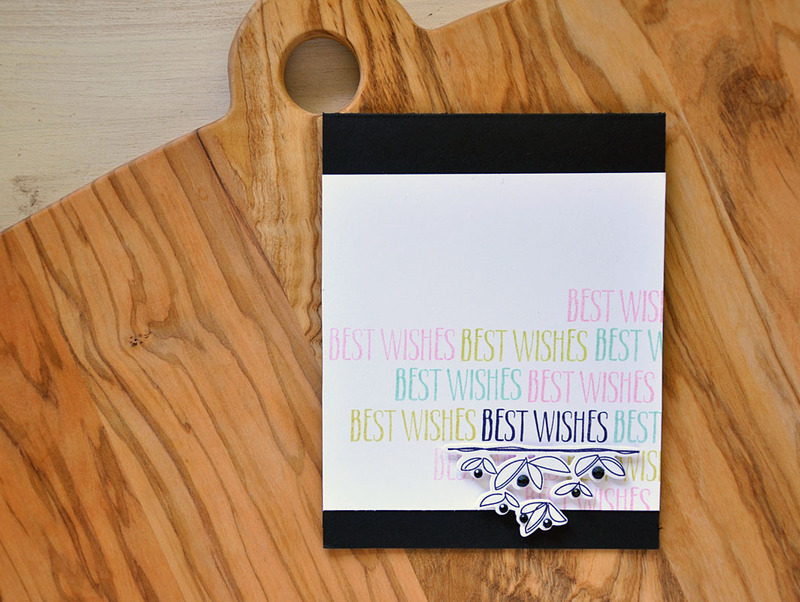 A very different take from my card from the other day using this same die. 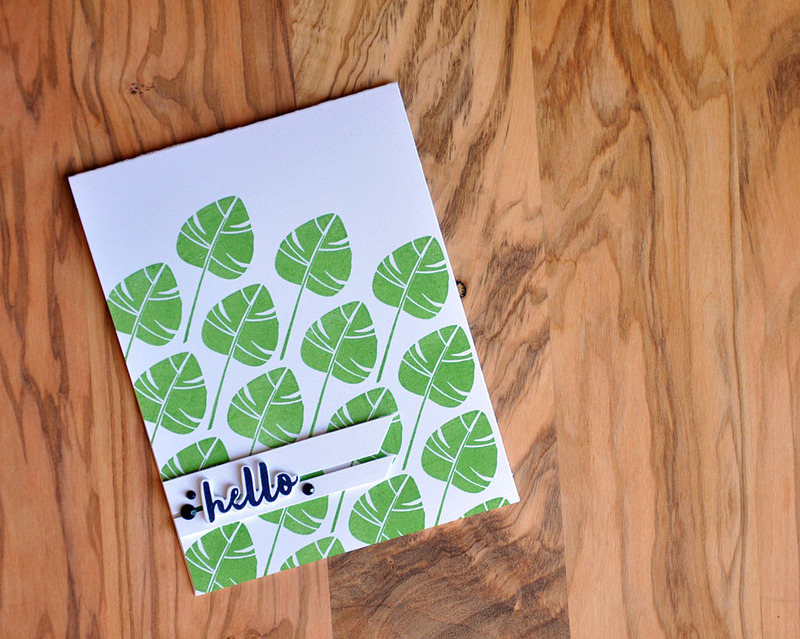 This truly is a versatile piece to add to your crafty collection! It would look beautiful colored with a rainbow of colors or even just an ombre as well. Well, there's a quick look at the Cover Plate: Scallops die. Just remember... this die will be available for purchase through Papertrey Ink, beginning July 15th. 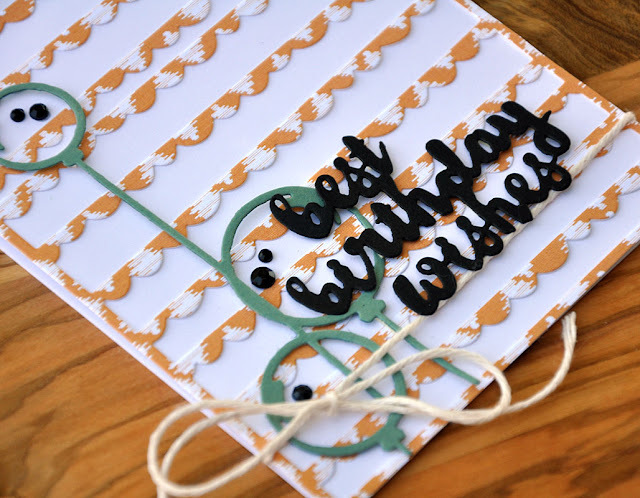 Hello and welcome to day two of the July Papertrey Ink countdown! Here I've let the sentiment take the show. 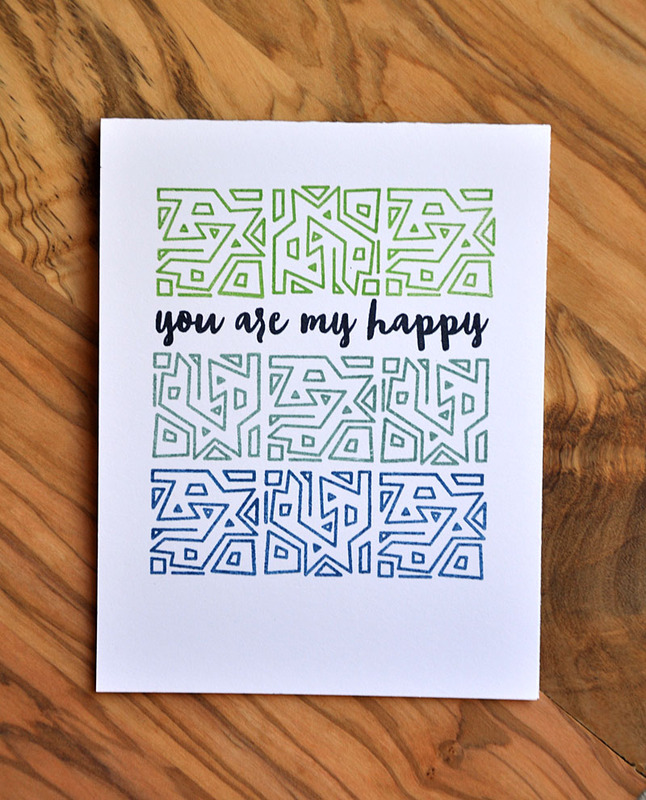 I stamped a repeating pattern in a color combo of Limeade Ice, Aqua Mist, and Lovely Lady. 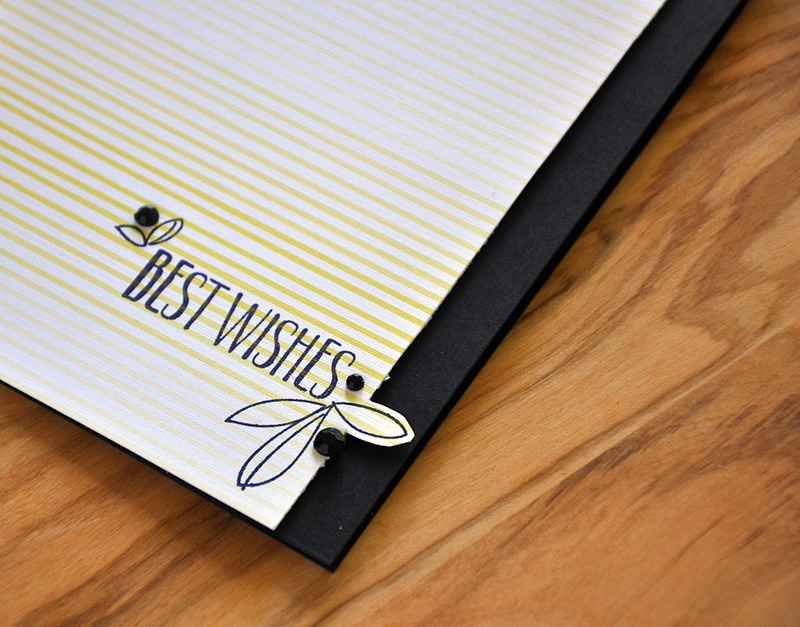 I stamped the focal sentiment in black and emphasized it with a portion of the Splits: Best Wishes frame. 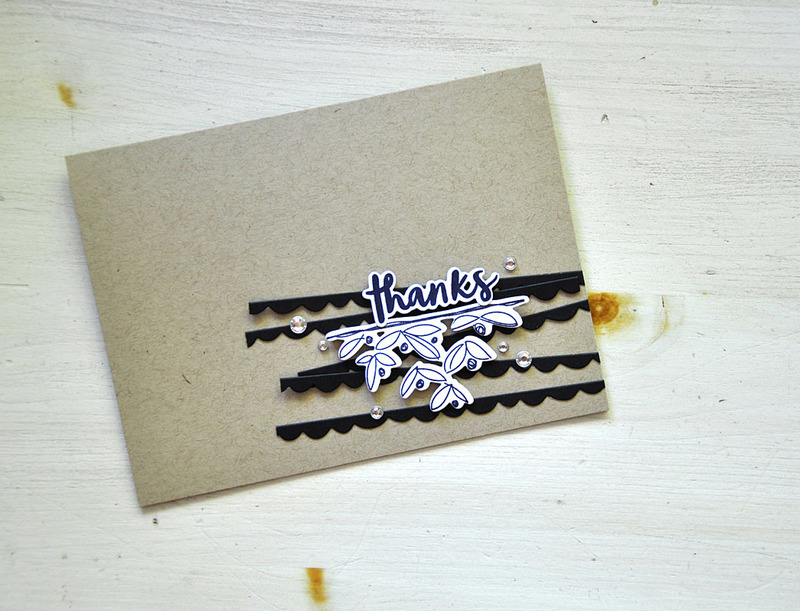 Then finished the card off with black rhinestones in place of the stamped berries. Up next, a look at the two extra images included in this stamp set. The sentiment and extra images were stamped onto a pattern paper sheet from the Ombre Strips paper pad. I trimmed the edge using a paper trimmer, being careful to cut only just up to the leaf. Then trimmed around the leaf portion by hand, keeping it intact. 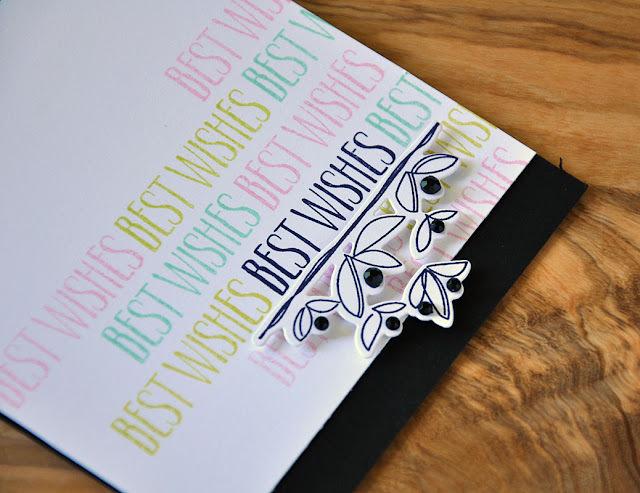 Well, there's another quick look at Splits: Best Wishes stamp set for you. I'll be back tomorrow with more! 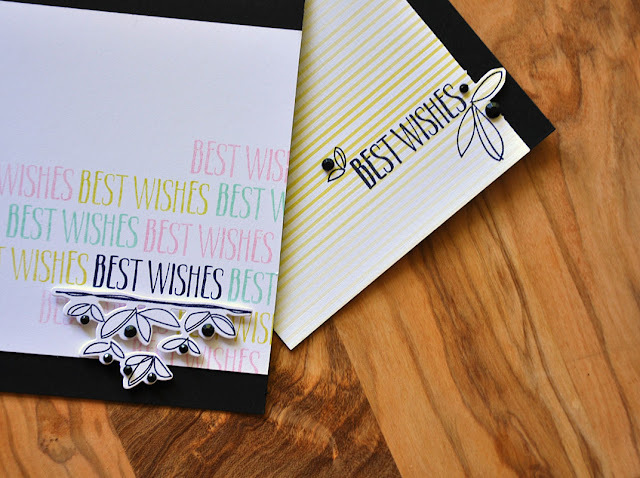 Just remember... this stamp set and it's coordinating die will be available for purchase through Papertrey Ink, beginning July 15th. 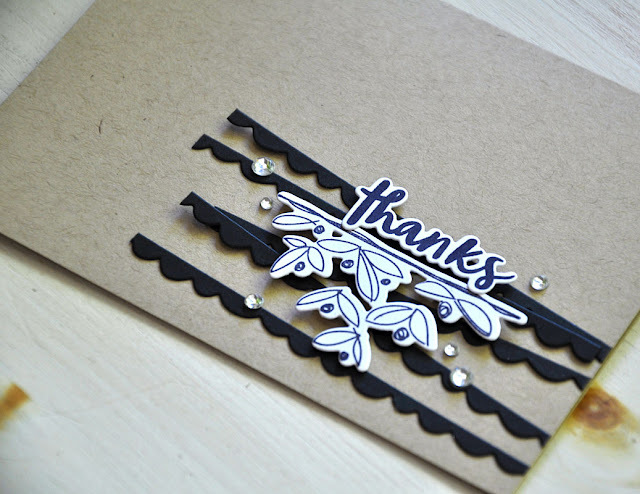 Now, be sure to visit Papertrey Ink blog for more details on this stamp set. Also, Melissa Phillips has a sample or two using this set too! For this months release I bring you a few new addition to my Stamping Simply lineup. Today I have peeks at the new Tropics stamp set, Splits: Best Wishes stamp set and die, and the Cover Plate: Scallops die. Up first a look at Tropics... This stamp set is a unique collection of tropical palms and tribal designs. Can be adapted for summertime projects, masculine creations, backgrounds, focal points, borders and so much more. 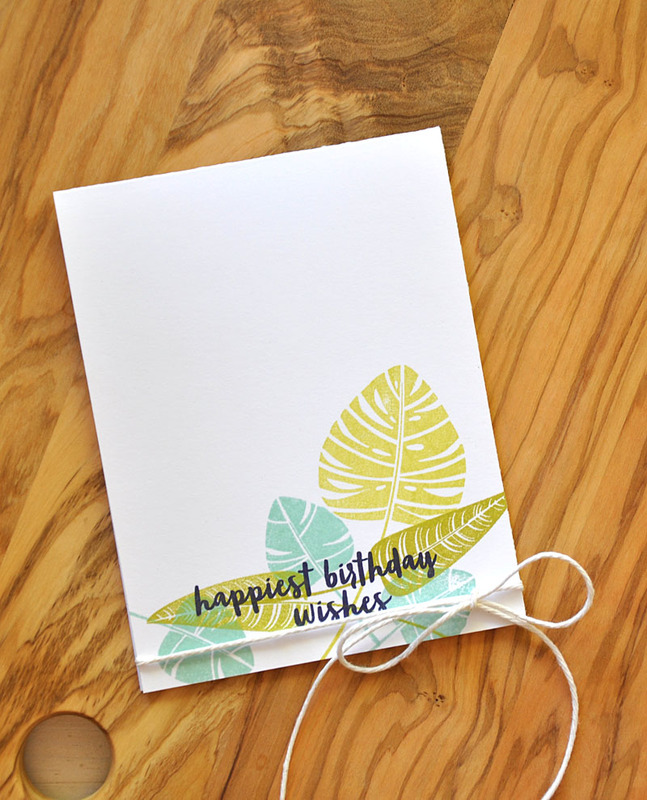 Today I've kept things super simple with a single layer card using a few of the palm images in a color combo of Aqua Mist, Simply Chartreuse, and Limeade Ice. Here's a Look at the sixth in the Splits monthly series... 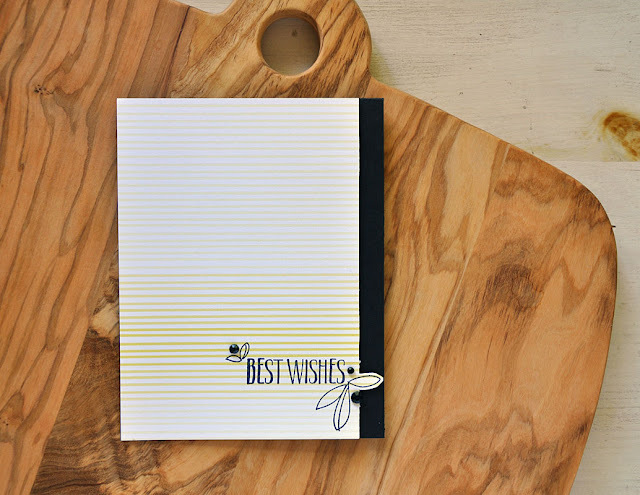 Splits: Best Wishes, and also the Cover Plate: Scallops die. 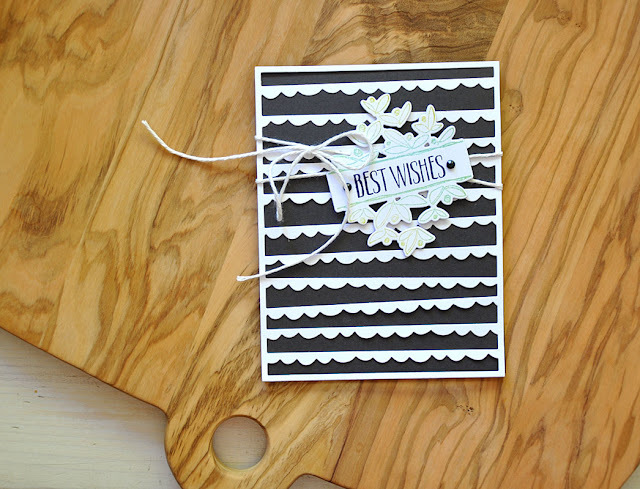 Here I've let the Cover Plate: Scallops die cut and Splits: Best Wishes frame shine on top of a smokey shadow card base. I just love both of these dies! The're such fun shapes and are so easy to work with. The Splits frame (with its berries and leaves) was inked using both Aqua Mist and Limeade Ice ink pads. Well, there's a quick look from me at Tropics, Splits: Best Wishes, and Cover Plate: Scallops. 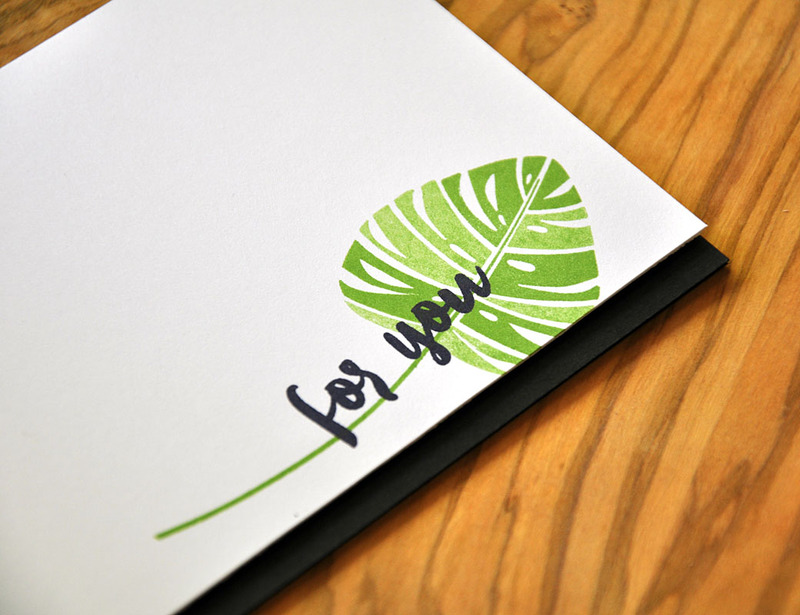 Just remember... everything showcased today will be available for purchase through Papertrey Ink, beginning July 15th.